— In 2013 elections, Democratic candidates ran behind Barack Obama’s 2012 two-party vote percentage by an average of 5.9 percentage points. A great Republican cycle in 2014 followed. In elections since December 2016, Republican candidates have run an average of 2.6 points behind Donald Trump’s 2016 two-party vote share, a notably smaller figure that could augur poorly for Democrats in 2018. This includes both special and regular elections. — However, since Trump’s election, in contests with no incumbent, the average Republican candidate has run an average of 5.1 points behind Trump in the two-party vote. Considering the sizable number of Republican retirements in the U.S. House and in state legislative elections, GOP-held open seats will be a pivotal part of 2018 arithmetic. — Because of Trump’s gains in the Rust Belt, the Midwest will be one major focus of the 2018 election cycle. The Midwest is easily the best region for Democrats in elections during the Trump era. On average, Democrats have performed 10.2 points better than Clinton in the two-party vote in that census region, while only doing slightly better in the Northeast (2.8 points) and South (1.5 points), and worse out West (-1.8 points). However, the Midwest and West have much smaller sample sizes than the Northeast or South. This past Tuesday marked the 75th time a Democrat and a Republican faced off in a special election for a state or federal office since President Donald Trump won the 2016 election. The result in District 35 of the Pennsylvania House of Representatives, a solidly Democratic seat in the Pittsburgh area won easily by a Democrat, did not tell us much on its own. Yet taken as a whole, the 75 special elections and the regular elections in New Jersey and Virginia in November 2017 may offer some clues as to how the political environment is developing as we head toward November 2018. In December 2013, Sean Trende of RealClearPolitics examined how election results in 2013 had leaned in the Republicans’ favor compared to the 2012 presidential vote. He found that Democrats ran, on average, 5.9 percentage points behind Barack Obama’s 2012 two-party percentage in 170 contested elections (regular or special races with both a Democrat and a Republican) for state or federal office in 2013. That is, if Obama won 50% of the two-party vote, the average Democratic candidate would have won 44.1%. While the Republican lean in these elections was not conclusive evidence that the 2014 cycle would be good for the GOP, in hindsight it seems that it may have been a reasonably good indicator. Republicans would go on to win nine net seats in the U.S. Senate (partly a function of the Senate seats that were up for election), 13 net U.S. House seats to increase the GOP’s seat total from 234 to 247, two net governorships, and 11 state legislative chambers previously controlled by the Democrats. Clearly, 2014 was an excellent cycle for the Republicans, especially coming on top of the red tsunami in 2010 when the GOP made massive gains at every electoral level. Fast forward to 2018. While the period considered here is slightly longer (late December 2016 to late January 2018) than Trende’s analysis, it is not much different. Trende’s sample included 170 contested races for 2013 while the data set we have since Trump’s election includes 176 regular and special elections with two-party competition. This includes the aforementioned 75 special elections, 37 New Jersey State Senate races, 60 Virginia House of Delegates contests, and four statewide elections in New Jersey and Virginia (one in the former, three in the latter). 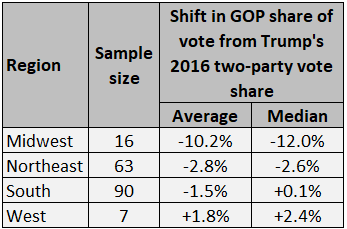 Overall, the data show that Republican candidates have run an average of 2.6 points behind Trump’s share of the two-party vote since the president won office, with a median difference of just 0.8 points. That is, if Trump won 50% of the two-party vote, we might expect the GOP candidate to win 47.4% if they followed the average decline. This is obviously well short of the 5.9-point average drop seen from Obama to Democratic candidates in 2013. That should give pause to those who think a major Democratic wave in November 2018 is a sure thing. Regarding the 2013 average shift, there is one additional factor to consider: That year, then-Gov. Chris Christie (R-NJ) won a landslide reelection that notably influenced GOP performance in the down-ballot races in the Garden State. While now-Govs. Phil Murphy (D-NJ) and Ralph Northam (D-VA) won by relatively large margins in 2017, their 14- and nine-point wins, respectively, fell well short of Christie’s crushing 22-point win. Still, when removing the 2013 New Jersey races from consideration, Trende found the average 2013 Democratic decline to be around five percentage points. That was still a large shift that seems — in hindsight — to have presaged the Democrats’ 2014 drubbing and one that was larger than Republicans’ decline compared to Trump. Still, Democrats certainly have reasons to be hopeful about a wave. In the Trump era, if we look at the races where no incumbents (Democratic or Republican) ran — 84 of the elections — the average Republican candidate ran five points behind Trump in the two-party vote. Considering the sizable number of Republican retirements in the U.S. House and the early signs of something similar in state legislative elections, GOP-held open seats will be a pivotal part of the 2018 arithmetic. Special elections made up most of the non-incumbent races (71 of the 84) as almost all special elections featured no incumbent (some elections in New Jersey and Washington state did include appointed incumbents). In those 71 specials, the average Republican ran 6.1 points behind Trump’s 2016 two-party percentage. In fact, according to left-leaning Daily Kos Elections’ new Special Elections Index, 2017 was the strongest Democratic year in special elections going back to the late 1980s. Additionally, it is possible that the environment will improve for Democrats: The average Democrat in 2017 specials with no incumbent ran 5.6 points ahead of Clinton’s two-party vote while the average 2018 Democrat has run 11.6 points ahead of her. However, there have only been five specials thus far in 2018, so the jury is still out on whether 2018 will be markedly better for Democrats than 2017. Note: *Includes all 176 state and federal elections that took place from Dec. 27, 2016 (Iowa State Senate’s 45th District) to Jan. 23, 2018 (Pennsylvania House of Representatives’ 35th District). While Democrats’ path to a majority in the U.S. House likely runs through the suburbs and winning seats that Clinton won in 2016, they will have to win at least some seats that Trump carried in 2016. While Democrats currently need a net gain of 24 seats to capture the House, Republicans only hold 23 seats that Clinton carried, and Democrats will be defending 12 seats that Trump carried. Moreover, the median district by presidential margin is Rep. Scott Taylor’s (R) VA-2, which Trump won by a little over three percentage points. So many have wondered if Democrats can win some of those Trump-won seats. The good news for Democrats is that they improved on Clinton’s two-party vote share by an average of 4.3 points in seats won by Trump in the whole data set of 176 elections (Trump won 97 of them). Conversely, they improved just 0.6 points on Clinton’s performance in seats she won. Still, while Democrats have notably improved on Clinton’s vote share in seats Trump carried, their biggest improvements were in seats that Trump won by larger margins. Democrats improved by an average of 4.8 points on Clinton’s two-party share in seats Trump won by at least 10 points but by only two points in seats Trump won by fewer than 10 points. Some of those more Republican-leaning seats were ones where Republicans could afford to give up some vote share and still hold on. Another area where Democrats are hoping to recover is in the Midwest, which contains much of the Rust Belt. Here, potentially competitive seats in states such as Iowa, Michigan, Minnesota, and Wisconsin could offer some pick-up opportunities for the minority party. Notably, the Midwest is easily the best region for Democrats in elections since Trump’s election. On average, Democrats have performed 10.2 points better than Clinton in the two-party vote in that census region, while only doing slightly better in the Northeast (2.8 points) and South (1.5 points), and worse out West (-1.8 points). That last finding might signal undue Democratic confidence in places like California, where there are many Democratic targets in traditionally Republican districts that Clinton carried. Still, we should apply caution to the findings in the Midwest and West. There have been far fewer elections (16 in the Midwest, seven in the West) than in the Northeast and South; the latter two include the many November elections from New Jersey (38 races) and Virginia (63), respectively. This analysis of elections since Trump won the presidency suggests that caution is in order when looking ahead to November. Essentially, there is a data point for everyone. If you want a Democratic wave, you can focus on the special elections and findings such as the Democratic improvement in the Midwest. If you want the GOP to hold its ground as best it can as the presidential party in a midterm, you will focus on the aggregate, where Republicans are not underperforming Trump in the two-party vote to the same degree that Democrats underperformed Obama in 2013. As the November waiting game continues, we will gather and analyze more data points from upcoming special elections to see if they offer additional insights.